Being good at one sport is hard enough. But being a stand out two sport athlete? That is even more rare than an unassisted triple play. While the Everett AquaSox were in town, I had a chance to meet a former Notre Dame Quarterback who traded in the shoulder pads for the batting gloves. 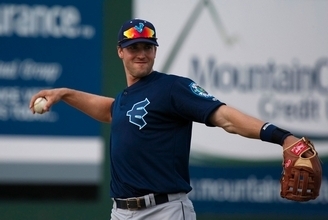 AquaSox 1B Evan Sharpley was a two-sport athlete at Notre Dame University as he played football and baseball for four years. Sharpley, who is from Michigan, cites the tradition of the school and their willingness to let him play both sports as the ultimate decision that made him choose Notre Dame and not Michigan University. When Sharpley came into the football program in 2005, he originally had been recruited by Ty Willingham. Willingham was fired before the start of the 2005 season and Sharpley had to build a relationship with the new head coach, Charlie Weis. In 2007-2008, Sharpley was the full-time starter on the football field as well the baseball diamond. In baseball, he saw enormous success as he was batting .324 with 13 home runs and 40 RBI. “The first two years I was at Notre Dame, I was doing a lot of both and I was spread pretty thin. I think in both sports, I was suffering as a result. Once I was able to get a good schedule down by my Junior year, I think it helped a lot,” said Sharpley. Transitioning from football to baseball has been a smooth process for Sharpley. There are even some concepts that he has been able to take from the gridiron to the diamond. At the end of the Spring of 2008, Sharpley was a full-time starter for the football team and a full-time starter for the baseball team. The decision to pursue a career in baseball was due to several factors, and the itch to play football has not gone away. Sharpley was drafted by the Seattle Mariners in 2009 Draft, which began his career in baseball. 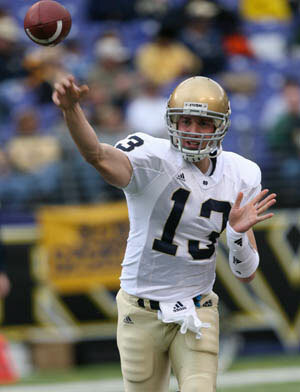 Sharpley had a successful career in South Bend. He went to two BCS games and evolved his baseball game to the point where he was drafted. Even though his athletic career did not live up to his expectations, Sharpley learned a lot at Notre Dame that has helped him in his quest to make it to the major leagues.